Have questions about the game or need a rule clarification? Submit your questions here! My friend and I have completely different interpretations of a card’s ability. How do we resolve this conflict? NOTE: Any serious dispute over interpretation of a particular ability on a card should be resolved with rock-paper-scissors. Any silly disputes should be resolved by hitting each other with socks filled with jelly. However, we will attempt to further clarify things on this page if you want an “official interpretation” to refer to or ignore. If you have such a dispute, let us know here. They are not just allowed, they are encouraged! You can see some fun rule variations here. What happens when you roll a 5 on Old Man Eggplant’s attack? There was an error we missed on the Old Man Eggplant card in the first printing of Gamewright’s 2.0 version of Squirmish. Old Man Eggplant is getting on in years, and he plum forgot what he does when someone rolls a 5. You can see the corrected version below that will be used in future printings. 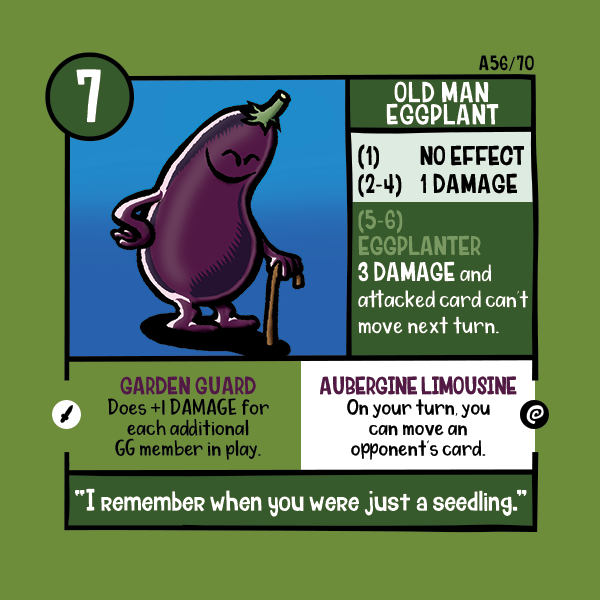 For the current version, simply print the below image and staple it on the card, or just remember Old Man Eggplant succeeds with his “Eggplanter” attack on both a 5 and a 6. The corrected version of Old Man Eggplant’s card. Does the Society of Slime healing power apply only to that card or can it be used to heal other cards in play? 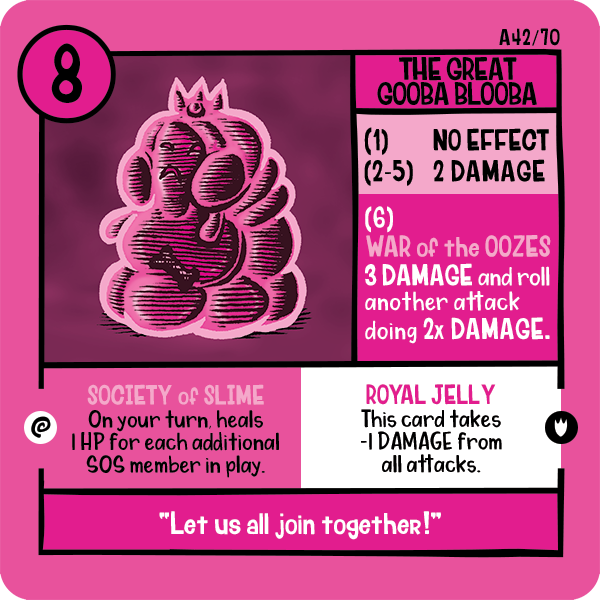 An example Society of Slime card with the group ability in question. The Society of Slime’s group ability reads “On your turn, heals 1 HP for each additional SOS member in play.” The intended interpretation of this ability is to have each member of the SOS heal 1 HP of damage off of themselves for each additional SOS member in play as they coagulate and merge together, producing a most unpleasant and aromatic ointment. Do all of the members of a group share the same group ability? Usually, but not always. The devout nonconformists in The Fraternal Order of Strange Fellows require that no two members behave alike. One other exception is Wormel of the Garden Guard. How can I get a copy of Squirmish? Go here to order it directly from Gamewright, or to find a store near you that has ordered it. Alternately, you can order it on Amazon (where you can also help us out by leaving a review, if you want). Can I get a t-shirt of my favorite Squirmish character? Indeed you can… every current Squirmish character can be purchased as a shirt (as well as an assortment of other merchandise) here. How do I submit a question to this FAQ?